In April 1975, just before the fall of Saigon, the U.S. government launched “Operation Babylift,” a highly publicized plan to evacuate nearly three thousand displaced Vietnamese children and settle them with adoptive families overseas. Now, thirty-five years after the war ended, Dana Sachs examines this unprecedented event more carefully, revealing how a single public-policy gesture irrevocably altered thousands of lives, not always for the better. The Life We Were Given will inspire impassioned discussion and spur dialogue on the human cost of war, international adoption and aid efforts, and U.S. involvement in Vietnam. The photograph shows a row of red-and-yellow striped seats inside the cabin of an airplane. They look like any seats on any commercial jetliner, though the mod color scheme does help date them to the 1970s. What is odd about the photograph is not the seats themselves, but who occupies them: on each seat lies a tiny baby swaddled in white pajamas. As human beings, we view babies as vulnerable, and a solitary infant, in any context, seems strange and pathetic. These particular children look like dolls that some prankish three-year-old left forgotten on the sofa. A few of these children appear to be sleeping. One faces the camera, looking both curious and forlorn. I first came across this picture in the spring of 2004, while reading about Vietnam on the Internet. I had been writing about the country for many years, but I had never seen the photograph or heard about the event it depicted. Now, on the Web site, I discovered that in April 1975, at the very end of the war in Vietnam, a group of foreign-run orphanages, with the help of the U.S. government, airlifted between two thousand and three thousand children out of Saigon and placed them with adoptive families overseas. The Web site showed photos from only one jet, but I learned that there had been many babies, and some four dozen flights that carried them out of Vietnam. As a writer, my interest in Vietnam had, until that moment, consciously focused on the country as a country, not as a participant in a war. Too much attention had centered on the conflicts of the twentieth century and as a result, I believed, Americans knew little about the place except that we had fought a devastating war there. Now, looking at this puzzling photograph of babies on an airplane, I reminded myself that every war produces its own set of bizarre situations. 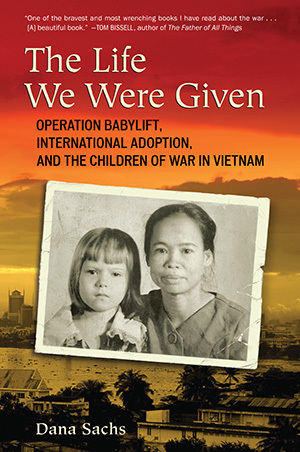 Apparently, Operation Babylift had been one such situation that emerged from the war in Vietnam. I moved along in my research and told myself to forget about it. Orphans play a peculiar role in our consciousness. The idea of a child without parents defies the natural order, evoking a pity so deep it feels instinctive, like some remnant of our pre-conscious past. Perhaps it’s the pathos of the image that explains why so many myths and legends include children raised by wolves, or floating down rivers in woven baskets, or wandering lost through haunted woods. Our desire to help such children takes on a meaning that goes well beyond the individuals themselves. By saving them, we’re saving ourselves and saving our species. And yet, we have always treated children badly, too. Throughout history, children have borne the brunt of war, and illness, and poverty. Nearly three thousand years ago, the Spartans created a brutal army of ruthless young men by forcing little boys to survive in the streets. During the seventeenth and eighteenth centuries, young boys served as “powder monkeys,” carrying explosives to gunners on board ships. Even in times of peace, children have filled out the ranks of farm workers and laborers throughout the world. It wasn’t until the mid-nineteenth century, around the time that Charles Dickens introduced both Pip and Oliver Twist, that society began actively addressing the gap between our expectations of how we should treat children and the reality of their suffering. In 1851, the Massachusetts legislature introduced the Adoption of Children Act, the first legal mandate requiring that adoption decisions promote the welfare of the child, not the desires of adults. Over the next few decades, American society came to regard adoption as a viable means of ensuring the well-being of children who had no families to care for them. Operation Babylift followed what had, by then, become a familiar pattern: war creates orphans, and then civilized society steps in to help. If the war itself revealed our basest nature, then humanitarian interventions unveiled our best--a deeply felt desire to save the lives of defenseless kids. As an April 1975 article in Time magazine described Operation Babylift, which was taking place at the time, “Not since the return of the prisoners of war two years ago [has] there been a news story out of Viet Nam with which the average American could so readily identify, one in which individuals seemed able to atone, even in the most tentative way, for the collective sins of governments.” It was a feel-good effort, to be sure, but the Babylift also marked a new phase of humanitarian endeavor, and it revealed a new philosophy with regard to what it means to “save” a child. Earlier efforts had centered on reuniting families torn apart by war; adoption was a backup plan. In contrast, this mission focused completely on adoption. Evacuation organizers claimed that these children were orphans. It quickly became clear, however, that a significant number were being put into permanent homes without clear proof of their eligibility for adoption. Some children, it seemed, came from Vietnam’s most vulnerable families, and they had been swept up in the panic of those last days of war and transported to new, permanent homes overseas. Eventually, I stopped trying to ignore the story of Operation Babylift. For the past six years, I have tried, instead, to unravel the tangle of events that led, in April 1975, to the mass evacuation of those children from Vietnam, approximately 80 percent of whom ended up in the United States, while the rest were adopted by families in Canada, Australia, and Europe. Even as the airlift was taking place, controversy began to swirl over whether it was an appropriate response to the crisis facing these children. The arguments focused on many factors--the oversight of the mission, the family status of the children involved, the appalling conditions of children in wartime South Vietnam--but these debates also coalesced around a single vexing question about adoption itself: is the primary purpose of adoption to find a home for an orphan or to satisfy the needs of a family that wants a child? That question, of course, remains, to this day, at the center of the controversy over international adoption.